Generally, I only take photographs or snapshots when I am out and about, someplace where I have hiked to or when I am playing tourist. This June day, just as Summer had truly began, was so graceful what with the salubrious temperatures in the shade of the backyard aspen trees that my two German shepherds, Draco and Leah, took on this pose of canine equanimity after worrying “the ball” for some hours on end. I couldn’t resist taking a couple of quick snapshots to preserve this moment for posterity and am glad that I did. Sometimes our human world is so full of energy and drama that we forget to take a moment to sit back and relax. That is when our canine friends remind us that there are often appropriate time for respite from the hectic world that we are caught up in. Their languid pose on this day helped me to sit back and clear my mind from the constant preoccupation that can disturb my sanguinity. I’m not one to generally set an alarm clock while backpacking and this morning, the morning of the Summer solstice, was no different. I had had it in my mind that I wanted to rise early from my sleep and hike up to the summit of Bison Peak and gaze out on the world as the sun rose over the new season. My subconscious seemed to be working well as I woke up just as the first tint of the new dawn was brightening up the eastern horizon. My conscious mind was cognizant, however, of my comfort and only with an hearty effort was I able to rise, quickly dress, grab the pack and head out, with Draco and Leah, my two faithful German shepherd hiking companions, towards the waiting divinity that is always the sunrise. From camp it was a near-one-thousand-foot climb to reach the summit of the Brookside-McCurdy Trail. The trail started out within the cloistering bristlecone pine forest and began to climb a series of switch-backs until the summit and its large, grassy expanse was reached. As I rose up ever higher, the sky changed from dark blue to dark purple to a dark red, each phase a bit less darker than the previous. From the summit I left the trail and walked north through the open meadows studded with oddly shaped pinnacles of eroded granite. It is nearly a mile from the trail to Bison Peak and each step was one of stunning beauty. Adding to the texture of the landscape were patches of snow scattered about, a reminder of the Spring storms that had precipitated so much late-season snow. As I approached the summit, the sky continued its transmogrification from the darker hues to the lighter. The sky became a rusty orange, and the sun below the horizon caught the high-sailing clouds and lit them up consequently casting a glow back down to the earth upon which I was trodding. There, ahead, was the peak, still some ten minutes away when the sun burst over the distant horizon formed by the Great Plains. It would have been nice to make it to the peak before actual sunrise, but no matter. This was as fine place as any to watch the sun’s first rays on this first day of Summer. There was a bit of a cold breeze and the granite itself was chilly as I climbed hand over hand to stand atop the rock that is the highest point. There was a small, wooden sign announcing my location as well as an ammunition box with a small diary and register. I signed in, happy to have this well-visited location to myself on this auspicious day. The sun lit up the granite, the golden rays enhancing the pinks, reds and oranges naturally occurring in the stone, and I gazed out on the world, entranced. Oh! Fine day! I could see out to the plains to the east; Pikes Peak somewhat nearby. The view to the west was sublime as the totality of South Park was spread out like a blanket between my perch and the distant Mosquito Range. Epic, sublime… words can barely hint at the soaring sensation within my heart as I sent my spirit out across the vast distances singing praise to all creation. Hee Hee! A smile lit up my face as surely as the sunlight did. This transcendent day’s significance was lost on my canine friends as well as all the critters that must make a living as best equipped to do so. The chipmunks gathered seeds and the dogs attempted to gather chipmunks. I discouraged the latter effort out of respect and piety for the wild ones. But the dogs continued to skitter about guided by their nose, eyes and ears. The mounds of rounded granite were a wonderland of activity for all involved. Draco, fearless when not being told what to do, scrambled up the side of a granite boulder that I would have thought impossible to do. Leah stood off to the side, her total countenance focused on Draco’s doings. Soon enough the cold seeped into my core and I felt at this point that I had paid enough reverence to the world around me from this high, exposed point. I scampered back down the rock and found a lee place where I could catch a bit of the new rays’ warmth while remaining out of the wind. Growing in profusion were a few species of alpine flowers whose petals wouldn’t fully open until a bit of that warmth I was enjoying should warm up the soil and air. Still, there was color added to the green grass and reddish granite. Walking back to the trail I took my time, moving through the rock garden slowly and contemplatively. There were sculptures that made me stop and observe for five or ten minutes before I could move on. I have seen dioramas that explain how the rocks are eroded but I can’t really explain it. No matter, as the end result kept me entranced and added a deeper appreciation for the natural world and the slow, nearly timeless, pace that the forces of nature use to create their wonders. I stopped and sat once or twice more, finding a grassy knoll or slope above a small valley where I could sit in the morning’s warm sunlight and enjoy the solitude and general peacefulness of the scene. It was a Sunday, so even down in the Front Range, were the teeming millions live and work, there was a certain stillness as most folks were at home, most likely still asleep. I consumed my snacks, and then decided that the time had come to meander back down the trail to camp. By the time I reached camp, the day’s sky was the cerulean blue we are all familiar with. Still early by the clock, I had done much already and eagerly ate my hiker’s breakfast before packing up camp. This camp, here at the headwaters of Indian Creek just north of Bison Pass, had treated me well and there was part of me that was loathe to leave. But, leave I must, for my food, and the dogs’, had run out and as much as I hated to admit it, the quick-paced civilized world beckoned. I had to return home and earn a paycheck, a task that I would rather not participate in but one which I must submit to. Camp was packed and making sure I left nothing but the faint imprints on the ground I had laid upon, I said a quick prayer of thanks before making off over Bison Pass and back down the Ute Creek Trail from which I had walked up four days previous. Back down the long grade over the nose-ridge between the two forks of Ute Creek, through the bristlecone pine forest, much cooler now in the morning’s easy temperatures, until I finally reached the creek bottom where the vegetation changes into a ponderosa forest. The hard part of the day’s hike was behind me and the trail, now at a slight grade, meandered easily down towards Tarryall Creek. I walked slowly and stopped often, observing the numerous lower-elevation flowers that were blooming radiantly. The evening primroses, penstemon, locoweed and some type of white rose were only the most prominent of a wide variety of species blooming and being activity pollinated by just as wide, probably wider, array of insects. The ponderosa forest scented the mountain air with a smell of butterscotch and made my passage just that much more pleasant. 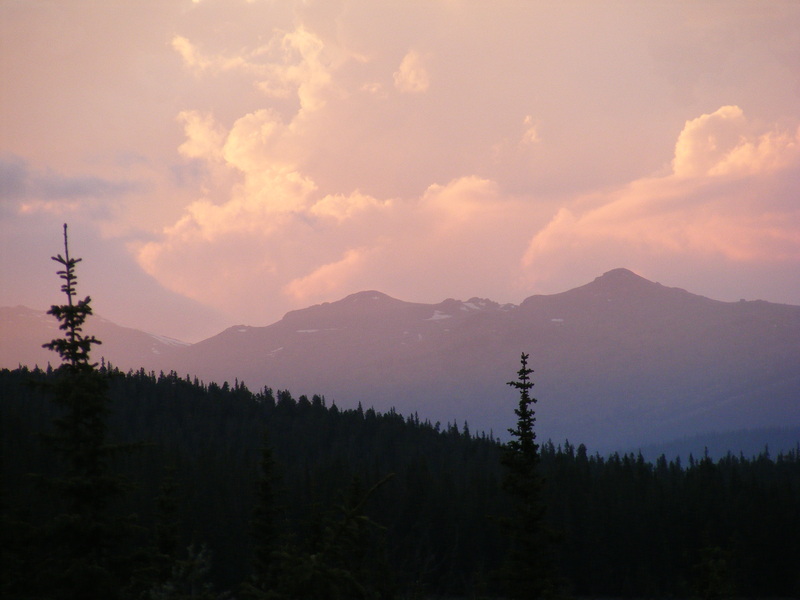 It also made it much easier for me to linger and enjoy the spectacle of June in the Rocky Mountains. Soon enough, I emerged from the Ute Creek drainage and found myself in the valley of Tarryall Creek. I turned upstream and followed the trail through wide open meadows filled with stunning, orange paintbrush. Alas, I turned one, last corner and found myself crossing the bridge from whence I had started my hike. The creosote smell emanating from the bridge was faintly and strangely pleasing. I strode over it as the dogs ran forward. Tarryall Creek flowed swiftly beneath me, filled from bank to bank with snow-melt. I was now brought back to the reality of the world at large and I was reminded that this runoff was enough to close U.S. 285 in another location when I had driven in. I wondered what the state of the highway would be when I drove back to my home in Gunnison, Colorado, not really expecting much change one way or the other (it was still flooded). I unburdened the dogs and myself before scrambling down a slope so that the dogs could have one final drink out of the wild river flowing below before we drove back home. I changed my clothes, having had the foresight to bring along and stash a fresh set in the car. I also took a swig of water out of another stash I had made. All too soon, I forced myself to take one last look around at the mountains where I had spent the last three nights. With a hearty sigh I took my place behind the wheel and fired up the mechanical beast that would speed me on my way. The windows came down and as I applied the accelerator the wind came pouring into the car. Leah and Draco, who normally has his head out looking around, were sprawled out, asleep and content. We all had a fine time exploring some of our wild places. I can only hope that it won’t be another decade before I get another chance to visit the Lost Creek Wilderness. Hike on! After a solid night’s sleep, I woke up and was instantly invigorated by the scent of the conifer forest the canopy of which sheltered my camp. Birds softly chirping in dawn’s early hour, my companion German shepherds, Draco and Leah, wagging their tails in eager anticipation for a day of exploring and romping and me, with a big grin having awoken in such a beautiful place. That was how this day began in East Lost Park. I was still a bit unhappy about not being able to complete the loop hike that I had wanted to do, but I also wasn’t about to let that spoil such a fine day here in the Lost Creek Wilderness. Near ten thousand feet in elevation, awash in the fresh verdant tones of the new vegetation and the reddish orange of the weathered granite, it is a sublime example of nature’s grandeur. There was no time or reason to feel the melancholy that could have overwhelmed me had I allowed it to. The dogs and I frolicked in the meadows, visited the streams nearby and otherwise took our time getting packed and ready to hike the eight miles to Bison Pass, where I planned on spending the night. I had found a fine spot to camp last night and hated to leave but decided to do so anyhow so that the next morning, Summer solstice, I could rise early and climb Bison Peak and watch the sun rise over the Great Plains to the east. The morning was still, not even a breeze to upset the perfectly static air. Breakfast, a couple of packages of instant oatmeal and one, precious cup of coffee, was then heated and consumed before I slowly and languidly packed up camp. Off we went, moving slowly up along the trail which we had come down the day before. I stopped at one rock to gain a small perch only to find another gentleman already doing the same. We ended up chatting for nearly an hour about living the good life, both of us all smiles at having the privilege of visiting this salubrious location. Continuing on my way I passed numerous people making their way down the trail from the Lost Creek Trailhead. Day hikers and backpackers alike, this sparkling Saturday brought forth the hordes of people who wanted to find a piece of paradise away from the noise and quick pace of the motorized world. Could their be any better endorsement for adding to designated Wilderness? Up past the raging waters of Lost Creek and the trailhead of the same name I went, revisiting the sights from not only yesterday but from those many years ago when I had first visited this area. The gestalt of those two experiences contrasts a bit with what I was experiencing at the moment, but now the whole has jelled into one fine remembrance of this part of the Rocky Mountains of Colorado. I returned to the Indian Creek drainage and visited the little side meadow that I had found so fine the previous day. This time, I took off my pack and strolled around for a half hour or so, exploring some of the out-of-the-way places on the periphery of the meadow. I almost decided to drop the pack there for good and spend the night here. It was a real toss-up for a bit, but then I decided that I really did want to visit the high peak the next morning and hefted up the pack onto my shoulders and continued back up the Brookside-McCurdy Trail towards Bison Pass. Eventually we reached the small meadow just north of Bison Pass. The climb up was instructive, watching the large creek slowly diminish into a small trickle the beginning of which was soon found to be springing forth from an unassuming gape in the meadow near the pass. It was early, hardly even mid-afternoon, so I soon set up camp and then took a luxurious nap in the shade of a large spruce. The trees in this area, incidentally, do not seem to be nearly as affected by the beetles that are consuming the Western Slope forests. I have to admit that lying out under the passing clouds, staring at the skies whenever my eyelids slid back, was a pleasant respite from consciousness. The shepherds nearby, lying askew on their sides, paws occasionally in motion reacting to a canine dream, added to the serenity of the situation. Nearly two hours later and the sun had arced across the sky enough so that the shadows had grown considerably in length. I explored a nearby knoll to the west of and above Bison Pass. This knoll allowed a fine view to the west and I could see the Mosquito Range and the Sawatch Range over the large expanse of South Park. 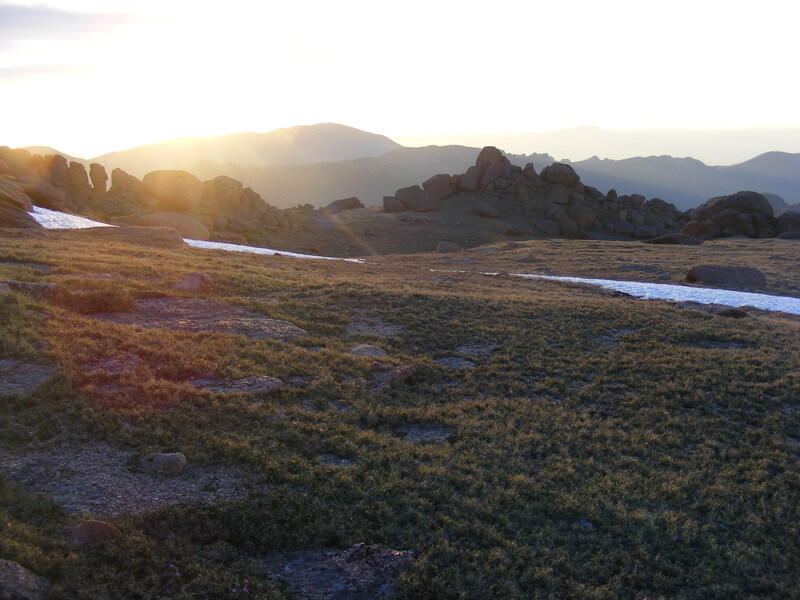 The view shed also encompassed Bison Peak to my immediate east as well as the South Platte Mountains to the north and a vast area of ridges and peaks to the south. Being early, I returned to camp to fix Tom’s Stew for supper. But I ate supper knowing what I would do and where I would go afterwards to catch the sunset. Back up to the knoll I went with Draco and Leah scurrying about, investigating purported signs of tree-going rodents and other ground-dwelling noise-makers. I wandered about happily on this weathered granite, content that although my plans had not gone accordingly, I had made the best of the situation and now found myself here at sunset with a fine view and all the quietude that I could ask for. As the sun approached the horizon, we found a small ledge of granite under a pinnacle of the same type of rock to perch ourselves on. Here, I could watch the day’s final rays slowly be eclipsed by the horizon while the dogs could peacefully wile away the crepuscular part of the Earth’s cycle. The colors slowly changed and faded as the sun dipped behind the distant mountains to my west. I looked at the mineral grains in the granite. I took in the forest and the vegetation in my immediate area. What a fine place to end my day at. I felt blessed to be here with my faithful companions. What a view of the world I had! Someday, perhaps this area will be truly wild country again and have large herds of elk and bison and their shepherds, the wolves and grizzly bears. But for now, I will have to be content with the landscape itself and the potential it represents. The important part for immediate consideration is to conserve as much as possible from mankind’s destructive ways. I lingered till darkness was nearly upon us and then slowly and cautiously made my way back down through the bristlecone pine and to the meadow where camp was located. By the time I arrived, the stars were out. Instead of immediately slipping into the tent, I dragged my sleeping bag out and snuggled up next to the dogs and lay back to watch the night sky. I was rewarded with an odd meteorite or shooting star and studied the constellations and the Milky Way. My eyelids began to sag and I hovered between consciousness and sleep; after a short dreamstate, I decided that it was time, finally, to bid adieu to the world at large and tuck myself inside the tent. A day that could have been disappointing had ended on a high note, and the sleep that followed was the deep, satisfying sleep of the content and satiated. I fed myself and the German shepherds, Draco and Leah, and then packed up camp and made preparations for the day’s hike. My goal was to make it down through East Lost Park and into Wigwam Park where I would spend the night. At about a quarter to nine in the morning we began hiking north on the Brookside-McCurdy Trail, also known as Pike National Forest Trail 607. It was wet and muddy from the melt water percolating out of the hillside. No matter, the day was warm and pleasant with not a cloud in the sky. A perfect day in the mountains. The first part of the hike passed along the large expanse of the meadow that runs parallel to Indian Creek. The large meadow is nearly a mile and a half long and half a mile across and is thick with willow. At another time of the year, or with better foot gear, I would have liked to explore the other side or make an excursion into aptly named Willow Gulch, a tributary of Indian Creek. As it was, I stopped and explored a small unnamed side tributary that was set in a small and pleasing meadow. Miraculously, it was fairly dry and I could walk around unimpeded. At the northern, lower end of the meadow Indian Creek’s drainage narrows into a small defile and the shepherds and I descended the next mile and a half through a thick lodgepole forest until we emerged from the wilderness boundary and met the Lost Park Road, Trailhead and Campground. There were scads of cars parked along the road and people everywhere, but I couldn’t be disappointed on such a fine day as this that so many folks wanted to get out and explore the woods. It just goes to show that perhaps we need to expand some of our wilderness areas and create new ones. This could be accomplished at a great savings to the taxpayer by closing down many unnecessary and redundant roads and motorized trails. At this same point, Indian Creek flows into Lost Creek, the major drainage of the area that also lends its name to this particular wilderness. The name is derived from the fact that this large volume of water is completely covered by an ancient landslide many miles downstream and the water flows under this huge heap of rock, thus becoming lost. It re-emerges as Goose Creek once clear of all the tumbled down rock. After a half a mile of hiking, I found the junction with the Wigwam Trail, known also as Pike National Forest Trail 609, and began hiking back to the south and soon re-entered the Lost Creek Wilderness. This is also were a serious reality check occurred. The volume of water flowing down Lost Creek was immense. It was beyond dangerous and to enter the creek and its raging torrent would have been a form of suicide. I knew that there was a way to cross in the form of an unofficial log-bridge in East Lost Park and here the gradient of the stream was so minimal that, had I fallen into the stream, swimming out wouldn’t have been a problem. The real issue was whether or not I could recross the stream at the lower crossing between Refrigerator Gulch and McCurdy Park. My memory of this crossing was absent and I couldn’t remember if it was a simple stroll across some of the aforementioned rock that had slid over the creek, or if there was a bridge or decent log crossing or if it involves a fording. The latter was what concerned me and I didn’t want to get myself into a situation where I was trapped and would have to make a long retracing of my route back. Also, this upper crossing was somewhat trepidatious and I was fearful for the canines safety. Had I been by myself without dogs, or had I had other folks around to assist with the dogs I may have attempted a crossing but decided to alter my plans and abandon my attempted loop hike. Well, I would come back some other time when it was more reasonable to cross and for the time being I would camp here in East Lost Park. I found a nice place in the woods on the southern end of the park. This area receives heavy use and there were many campsites to choose from. In some ways, it was lucky that I got here early on this Friday because they soon filled up with hordes of people. Well, it was busy but still everyone who was here had hiked in and overall it was a fine, quiet place to be. And the scenery was spectacular by my standards. It isn’t the grandiose mountains of Rocky Mountain National Park or the Elk Mountains, but just good, solid country. Green meadows and aspen, and red, weathered granite abounded in every direction. I felt comfortable and at home in this salubrious atmosphere. Once camp was made, I decide to go ahead and cross Lost Creek on the log bridge. It was sketchy but I made it across without incident. Draco did the same, but Leah almost fell off into the drink. I was glad to have not tried this crossing with a load on our collective backs. Since I had plenty of time, we walked up the Wigwam Trail and up and over the small, unnamed pass that leads into Wigwam Creek. Good country here, and if you like to scramble on granite this place is heaven. On our return trip, Draco and I both crossed the bridge but Leah once again almost fell into Lost Creek. I’m sure she would have been fine swimming out of the mostly placid water, but it was a huge volume and I was worried for her. There is so much to see in a place like this that even after our additional four miles of hiking I could not sit still. So, we hiked down adjacent to Lost Creek on an un-maintained trail. Here, the park ended and we entered a narrow, steep canyon and the water went from placid to a raging whitewater. Seeing this, I am glad that I didn’t attempt the lower crossing. This area was fun to explore, full of large, rounded granitic boulders. The temperature was perfect and the dogs didn’t try to get themselves killed by entering the watery torrent. Eventually, the trail came to a location where further progress would have involved a bit of scrambling and as the shepherds aren’t really meant for that I decided to return to camp. But, I could not yet sit still and soon began to explore the small, unnamed tributary toLost Creek up behind camp. Up and up we went into the forest, not really paying attention to our landmarks but just wandering around enjoying the forest’s smells and sights. I made a big loop and soon found myself emerging from the conifer and back into East Lost Park. By now, the sun was beginning to approach the horizon and I decided that I could finally sit down and watch the setting globe of brilliant light transverse the final part of its arc across the sky. The golden hued light just added to the spectacle and I imagine that all of us humans were pleased with having been in this park this evening. As the crepuscular light hung over the park, I lay back among the shrubs and grass, content with my station in the world. Soon, I crawled into my tent and snuggled up into my sleeping bag and before long I was sound asleep. I had bear-proofed my food by hanging it properly but with Draco and Leah sleeping nearby, tied to cable stays, I didn’t worry much about any bruins. I went to bed somewhat disappointed in not being able to complete my loop hike, but content nonetheless that I was here in this special place. The past few many years I had been an early season backpacker. Sometime in mid to late March I would gather up all my gear and head out to the desert country where, contrary to my cold home in Gunnison, Colorado, the land had a smidgen of warmth. This year I decided to wait until mid to late June before I would begin to backpack. I’m not sure why, I suppose it was just my personal preference for this year. Thus, just after mid-June, I decided that I could finally get out for a few nights under the stars. Some many years ago, I believe it was way back in June of 2006, I had done a three-night backpacking trip to the Lost Creek Wilderness. I decided that I would like to replicate that hike and revisit this area. I had remembered it as being an attractive place to be, mostly under eleven and twelve thousand feet in elevation and full of scenic rounded and weathered red-orange granite. So, I packed up for a three night trip to see how my memory jibed with the reality that I would find on the ground. I began my hike at the Ute Creek Trailhead on the Tarryall Road. This road runs parallel to the creek of the same name for many miles and is itself a somewhat scenic drive through the Rocky Mountain pediment found just west of the foothills that rise out of the Great Plains. 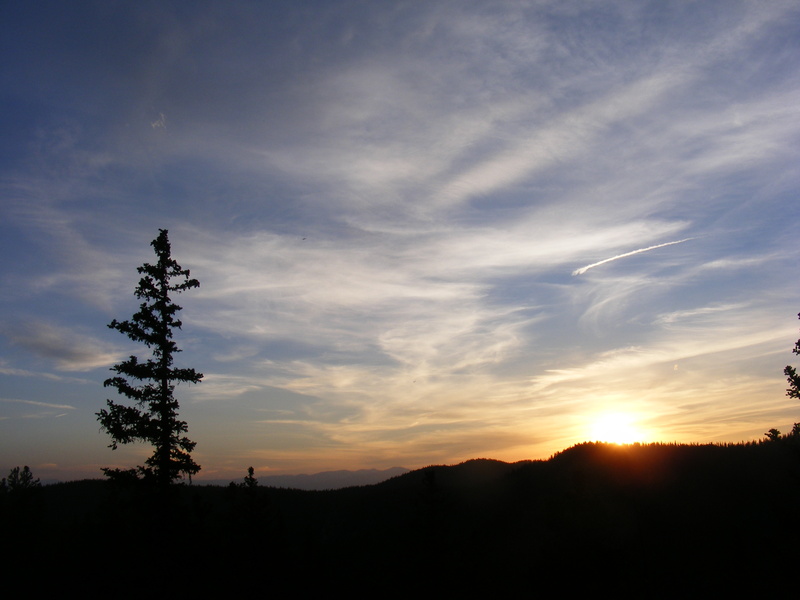 The Ute Creek Trailhead is located, incidentally, on the west side of the Lost Creek Wilderness and the entire area is managed by the Pike National Forest. Not only did I want to revisit old memories, but I also love the eastern slope of the Rocky Mountains. The eastern slope drains into the Atlantic Ocean and is drier than the Western Slope. The later collects more moisture as the storms travel west from the Pacific Ocean and these storms tend to deposit the majority of their precipitation in the western highlands. While at times this area here to the east can be sere it also has a special flavor not found anywhere else and I was pleased to be visiting a place that feels like home to me, having lived for over a decade in the region previously. Most of my hike would be conducted in the Tarryall Mountains, and like the remainder of Colorado, it had also been the recipient and benefactor of the heavy May storms that had left snow and moisture more than normal. Thus, Tarryall Creek was running at a swift pace. The Forest Service has placed a bridge at the trailhead to cross the creek, as it would be extremely dangerous to attempt crossing otherwise. 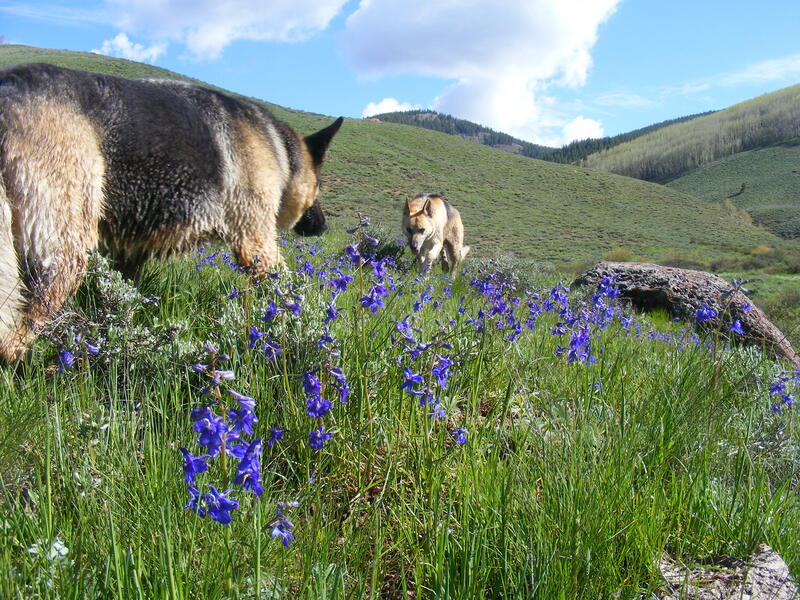 So, after parking the car at the trailhead, I loaded myself and my stalwart German shepherds, Draco and Leah, and we walked down to the bridge, crossed said bridge and began hiking on the Ute Creek Trail, also know as Pike National Forest Trail 629. Here grows ponderosa pine among the aspen glades. The grass had already greened up and was now beginning to brown out, an odd sight for me coming from a place where the grass had yet to green up completely. There are plenty of wildflowers growing here but not in the same profusion that I am used to seeing on the Western Slope. Nonetheless, I felt at home as we strode along the trail, adjacent to Tarryall Creek for the first half a mile. After this bit was passed we swung, along with the trial, into Ute Creek. This small defile drains down from the Tarryall Mountains above. I remember it being dry the last time I was here, but I was pleased to see that there was ample water running down its pebbled bed. I didn’t remember the pleasing hike through groves of ponderosa and aspen as the water coursing below the trail emanated cheerful gurgling sounds. It is green here in late June and the ponderosa scented the air with the fragrance of butterscotch. A most pleasing way to begin my trek. The trail didn’t climb too steeply when we followed the creek directly but that was soon to change. I did recall on my previous adventure here that the climb up to Bison Pass and the junction with the Brookside-McCurdy Trail was hot, dry and steep. According to the map, we were to climb nearly seventeen hundred feet in about a mile and three quarters. My memory of this was correct, as the trail lived up to its infamous memory. By the time we labored up the grade the dogs and I were tired, thirsty and ready for a rest. Fortunately for the dogs there was a bit of snow remaining from the Winter and late Spring piled up on the north side of the pass and they gladly romped and rolled in white, frosty heaps. We stopped there to recharge and I noticed that contrary to the brown grass growing along Tarryall Creek, elevation approximately eighty-eight hundred feet, the grass here, at eleven thousand feet in elevation, was still brown because it had yet to green up for the season. What a study in contrasts! 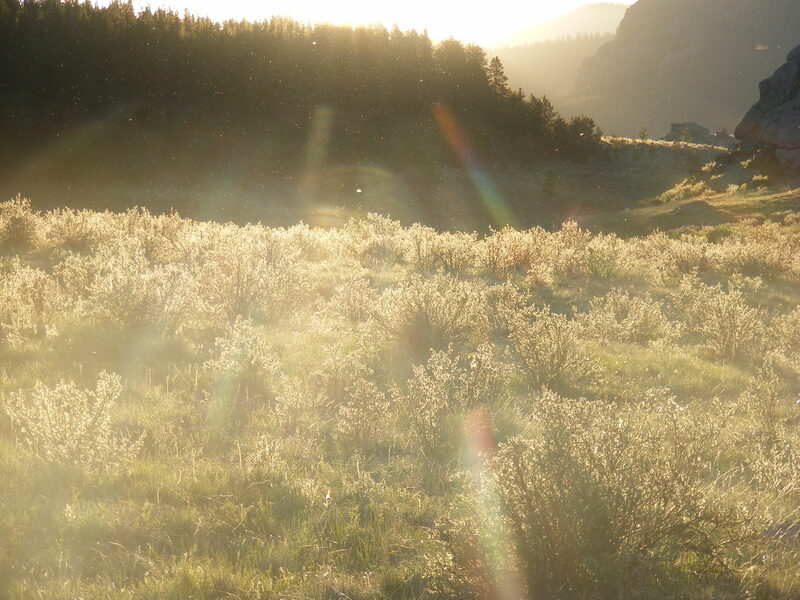 But, that is part of why I love living and hiking in the Rocky Mountains. I had earlier decided to make this trek in a clockwise direction although when I had done it previously it was counter-clockwise. So, I now found myself in the headwaters of Indian Creek. Here, near the pass, is an open meadow studded with spruce and bristlecone pine. It is a nice locale, and I was happy to have spent a bit of time here lingering during an intermission in our first day’s trek. I wanted to descend a bit before camping so after our rest we began the hike down to the upper end of a large meadow along Indian Creek. As we descended the water began to collect in the stream and Indian Creek soon became challenging to cross without getting wet. The dogs and I dropped down about a thousand feet and made camp at the forest’s edge. My view for the evening was to the north, and I could see the towering summits of the Platte River Mountains. I tried to explore a bit, but I found that almost everywhere I went was sopping wet with melt water and I soon gave up, content to relax in camp and enjoy the scented pine and general quietude. Camp was made, the dogs were fed and after a nice, hot dinner of Tom’s Camp Stew, an appealing concoction of Vienna sausages, ramen noodles and canned corn, we all sat still and quietly enjoyed a sunset of magnificent color. The clouds that had earlier threatened rain had instead lingered over these high peaks and caught the last rays of sun pouring over the Great Divide far to my west. It was a challenging hike, physically but not technically, to reach this point and I was pleased to be here. An auspicious start to my four days of hiking, this first day ended on a high note of a glorious sunset. Ho! for the Rocky Mountains! Hurrah! ‘Tis the Ides of June! Hooray! ‘Tis Green throughout the hills! Yippee! That verdant carpet is punctuated by brilliant speckles of intense color in the form of blooming flowers. And in the higher reaches there is still snow lingering. Yeah! I was blessed to have this day, to explore and walk among my beloved Rocky Mountains! The intrepid shepherds, Draco and Leah, felt it. They could barely be contained, so full of vim and vigor were they. I felt it, my stride was long and purposeful throughout the miles of steadfast trekking. Blue sky and white clouds, puffed up and towering. Green, green, green… the fresh verdure covering the landscape only missing from where the rock itself wouldn’t allow growth or where the flowing water inundated the soil. Water! Everywhere was water, springing forth from rivulets emanating from the hillside and pouring down every defile. Most the snow is gone, melted off but it has soaked into the soil, absorbent like a sponge only to be discharged elsewhere. Some snow lingers in the high places especially on the shady side, but it won’t be there for long as the temperatures continue to approach their Summer highs, well above the freezing point. Driving up from Gunnison I parked the car, my trusty red Loyale, along the Spring Creek Road at Deadman Gulch Road. The latter is a bumpy monstrosity suitable for high-clearance vehicles or dirt bikes only. It should be shut down and made a trail, setting aside more precious acreage for wildlife and wild landscapes, but regardless, with a hearty “Come on, Dogs!” we began to walk along it past high ridges of sharp rock. A word of warning: This entire hike was done along trails open to motorized vehicles so remember that you will be sharing space with fast paced and possibly noisy recreationalists. But the Creator bestowed blessings on me and I saw not one other person the entire day excepting a Forest Service employee. After a mile or so, the road ends and from this terminal point two trails fork; I chose the right-hand fork, the Deadman Gulch Trail, Gunnison National Forest Trail 420. My entire hike was on Gunnison National Forest land, part of the vast landscape of public lands that make up the county where I live. Another mile brought me to another fork and again I chose that which branched to the right. This is Bear Creek. The water flowing down along the first two miles of my hike wound its way sinuously through meadows resplendent with tall grass, yellow asters and purple Delphinium. The water went down and I went up! Hiking up Bear Creek, on Trail 415, the foothills of the Elk Mountains. Sublime barely begins to describe the day. On and on, footfall after footfall, my muscles begin to tire but I don’t stop, can’t stop, didn’t care, because this is all new to me, and I must see what is here, experience it for myself instead of simply envisioning what is on the map. The grade is slight, for the Rocky Mountains. I continue to climb and soon the green grass fades away to brown and tan, the remnants from the previous year’s growth. It is still cold here and the vegetation has yet to renew. Spring’s end hasn’t yet been announced here where the ground is still marshy from all the melted snow. Conifer forest everywhere I look. After an hour of hiking, the three miles between the previous confluence and the headwaters of Bear Creek has been crossed. I meet up with the Spring Creek Road, which in the interval has wound around to climb to this point by a longer route, making it easier for vehicles to reach here. I luck out, there is no intrusive sound from motors and I cruise around gallivanting through the sub-alpine forest. I turn left to continue my counter-clockwise loop. I bit more climbing and I am astride Reno Ridge. Were I to continue I would drop down into Cement Creek but I turn left once again and walk the ridge line. Now the views have become expansive. I can see Teocalli Peak and much of that portion of the Elk Mountains. The red soil. Green vegetation. Blue sky. White clouds. White snow clad against the distant peaks. Purple crocus emerging from soil freshly shed of snow. I am in a raging glory of mountain extravagance, the smells; sights; fresh, brisk air… and no motors. The trail descends into a small drainage that sinks down to the aforementioned Cement Creek. Now I find myself wary of the lingering snowpack, deep and wet, with no mercy for the poor fool who is aghast at the thought of post-holing up to his waist. Fortunately, this poor boy is able to exploit a dry dry face of this small ravine and follows the trail on his own path. I find a warm, dry patch of rocky soil to rest my keister upon and greedily consume the limited and scrumptious victuals that I had lugged up to this point. The dogs rest a bit, but only a bit as there is too much to investigate and they busily stick their snout in a variety of inviting locales. Cement Creek below is so green… there can’t be any more green than this green. Its north side is one vast aspen forest and the grassy meadows just add to the cacophony of verdure. That’s got to be the lamest thing I have written but it is so true. So green than when I look back on this hike during the upcoming winter months, when all is white and frozen and the days are short, I will think it nothing but a a figment of my overactive imagination, a hallucination and nothing more. But nay, it is as real as it gets and Glory Be! I have seen a marvel and beheld the Rocky Mountains in a moment of splendor. I continue after my moment of revelation, continuing on the north face, still coated in snow, but I suffer through it, the contrast between green and white tormenting me with the yet unfulfilled promise of unrestricted hiking and exploring. Soon enough I cross a ridge and am back on the gloriously warm and dry and green south side and from here it is an easy-paced stroll down to the Deadman Gulch Trail. The junction is atop the divide and making another left turn I begin to descend the gulch for which the trial is named. I do down. The dogs are still amped and although tire I am too. The grass is a bit brown and hasn’t quite renewed but it will soon. Down and down I go, passing small side gullies and amazed at how much water is flowing in this small drainage. This upper reach of Deadman Gulch can’t drain more than five or six square miles. Regardless, the water is moving and the volume is more than most years. A late, wet and cold May has created this late runoff and the water is ever moving, swirling and percolating, the noise an ever present accompaniment to my hiking. Hurrah! I have reach Bear Creek again but from a different direction and my loop has been completed. Oh! The sights and sounds, the smell of fresh spruce and pine, of fresh grass, has been a blessing of unforeseen richness and variety. There only remains a scant two mile to go before the “cherry-stem” portion of my hike is retraced. But I can’t help myself, I meander, much like the adjacent stream, and look for things to do. This day must not end! No! It must continue. I find a rock outcropping to sit upon, light up yet another bowl and rejoice at this gift, this gift that was unexpectedly diverse in mountainous texture and contrast. The water is cold as I wade across the surprisingly swift and deep water, but who cares! The day has turned warm and the sun is blazing and now the water is refreshingly cool and soothing on my overworked feet. The dogs don’t care, coated with fur, they seem impervious to the cold water, perhaps even more refreshed than I. Strolling now, singing out loud knowing that there are none but Supreme Beings to judge my off-key wailing. All is right, the car is in sight and suddenly this spectacle of a day has come to a close. We all load up in our internal-combustion magic carpet and cruise back home to Gunnison, Colorado, with more oomph under my right foot than a Roman emperor could ever have imagined. A fine day, a great day… Blessings! Draco distracted in Deadman Gulch… What’s that? After attending the memorial service of my dear, departed friend the previous day near the small town of Gardner, Colorado, I went over to the house of another friend where we commiserated about some of our past experiences and lamented the unpredictable cruelty of sudden death. He lives on a small knoll overlooking the Upper Huerfano Valley and it is, in my opinion, one of the most scenic locations in the country. We watched the sunset over the Sangre de Cristo Mountains to the west as that knife-edged ridge became silhouetted against the fading light as darkness encroached. The next morning I woke early and enjoyed the sunrise to the east, rising over the western extent of the Great Plains. Having lived in the vicinity for over a decade the surrounding mountains are all familiar to me. I still remember the names of the sundry peaks and have stood atop of many of them. I have explored their crevices and recesses and driven on most of the backroads in the area. This area is dry but beautiful and my snapshots just don’t capture the true beauty and soul-stirring feeling that emanates from these hills. I left early so that I could return home to Gunnison, Colorado, and retrieve the dogs from the kennel. Near Coaldale, on U.S. 50, I stopped on the side of the road to marvel at the Arkansas River, normally low-running and clear, running full of swollen, muddy water. A marvel of this wet, cold spring that is just now producing the high water runoff. I managed to get home early enough so that with the long day I was able to take the shepherds and myself out for an evening hike up at Mill Creek and Lake within the Fossil Ridge Wilderness and all part of the Gunnison National Forest. From the Gold Creek Trailhead it is only about two or two and a half miles to the lake and leaving the car at about half past five I had plenty of time to make it to the high country and back before dusk settled in for the night. 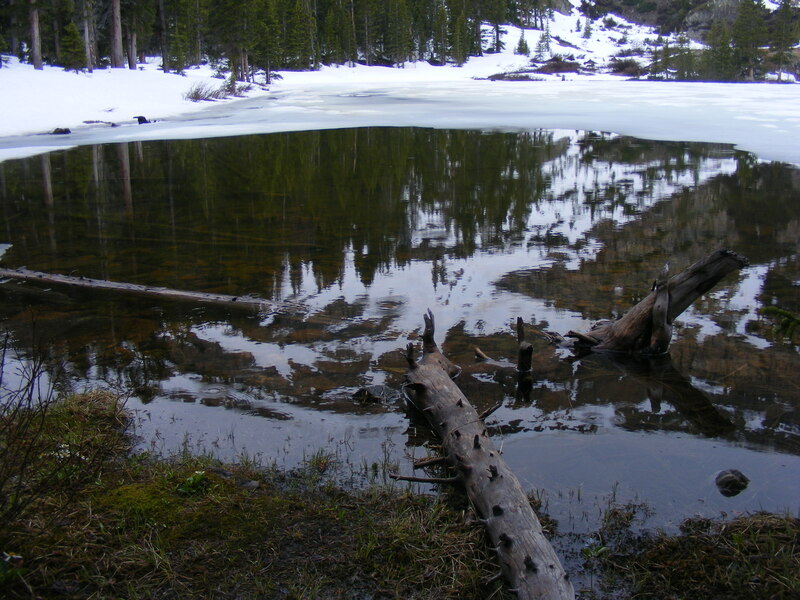 It is still technically Spring, being a week before Summer solstice, and therefore there is still ice and snow on the lake and the surrounding high places. Mill Lake sits just above eleven and a half thousand feet in elevation and on a east to northeast aspect. I do love these long days when I can get outside even after a long day spent doing something else besides hiking and exploring. Mill Lake is a place I have visited numerous times. Typically glaciated, it is obvious to any who have had even just a modicum of geological education that the mountain had been carved out by a huge mass of flowing ice. The lake was formed when the glacier retreated and left behind a pile of rock that had been shoved along to the glacier’s end. This moraine has dammed the water’s flow and created a lake that will, in geologic time, soon be filled with sediment. After my unfortunate focus on death the last two weeks it was refreshing to my spirit to find that the flowers along the trail were blooming and that the aspen were green. The snow’s melting sent torrents of water crashing down the steep creek, frothing white and noisome with the reverberations of its constant pounding off the stone. That hard rock will eventually be reduced by this action, though it will take much longer than the scale of human history will allow. Once at the lake there wasn’t much place to go as the mounds and heaps of snow impeded any attempt to navigate. It could have been done, but I despise post-holing through deep, wet snow and with the evening coming on I was more interested in staying dry. At least, the coolness kept the insects from swarming! With the setting sun the shepherds and I returned to the trailhead and my long day was nearly complete. I am glad to be back home and ready to continue my adventure another day, and thank the Creator for allowing me this day.